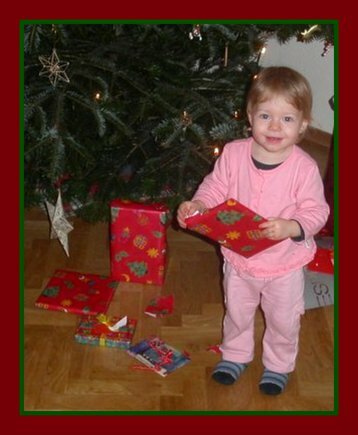 So cute and special: a personal(ized) Christmas gift from baby or your toddler for your loved ones! Giving little Xmas treats from baby to your family and close friends is a thoughtful idea and there's a number of gifts you can make with and from your little one. Here are some ideas for homemade presents as well as for things you can buy at the shops or online and then personalize with baby's photo or other details. Buy a snow globe and display the little one's photo. Depending on the snow globe you can insert one or two small pictures of your daughter or son or even a family photo with baby. You can choose between a horizontal or a vertical photo. This is a perfect Christmas souvenir and will become a treasured keepsake for years to come! This is so simple and yet such a cute little something! Buy a ready-made frame with all the 'Christmas stuff' on. 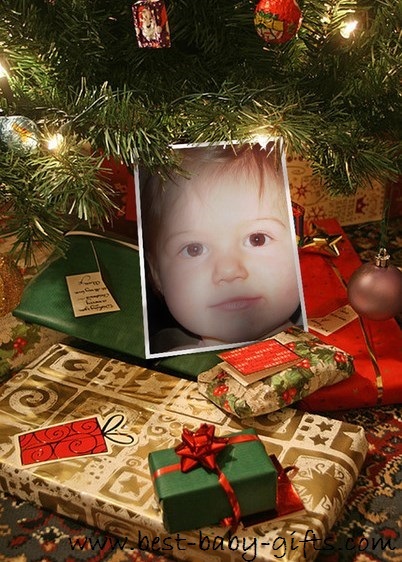 Add your little one's photo - if you like in an Xmas outfit - and you have a wonderful Christmas tree hanger for your own family, the grandparents, other relatives, close friends, etc. If you are a crafty person, you can even make a baby Christmas tree ornament yourself. Get a little plain wooden frame, paint it with a Holidays theme or add some Xmas stickers, rhinestones, glitter, etc. and attach a satin ribbon to hang it on the tree / the wall. If you rather opt to buy one - and we all know new moms and dads haven't got a lot of time -, have a look at Hallmark's 2018 edition 'baby's 1st Xmas' ornament or the beautiful one from Banberry pictured here. Make a beautiful and adorable tree ornament with baby's hand or foot to give to grandparents, aunties, uncles, friends, etc. And you might even like to keep one as a keepsake for yourself. Get a clay hanging keepsake kit: The sets contain clay, satin ribbons and everything you need to come up with great hand- or footprints of your peanut. The clay will dry into a hard and durable stone-like material in 2 to 3 days. Your keepsake can be displayed as a holiday ornament on a tree or as a wall hanging. If you like, personalize your ornament with your little one's name and the year by either carving it on with a toothpick or by writing on it. Finish with metallic paint and / or glitter. Tip: it is easier to take a foot print since babies tend to make a fist or clinch their fingers when you try to press them into the soft clay. If possible, try to do it while your little one is asleep. Clean baby's hand / foot straight away! Suitable for babies up to 2 years. Your relatives will be thrilled! Alternatively decorate a Xmas bauble with your daughter's / son's handprint (be careful and use non-toxic colors only) and add the name. Make a homemade calendar with your little one's first pictures. Especially grandma and grandpa will like to hang that somewhere in their house! And Mommy or Daddy can take it to work. Do it yourself calendars are pre-printed calendars where just the photo space is free. All you have to do is to insert some cute photos. Your offspring's handprint or footprint made with common watercolors make a great calendar sheet, too. And if you have a toddler that likes to be creative let it scribble its first trials with pens. You can also create photo calendars online. All you have to do is upload some pics and have the calendar printed out. This is slightly more impersonal than adding your pictures by hand but still makes a great Christmas gift from baby! This is a 'convenient' Christmas present from your little one if you need a whole lot of gifts for your family, relatives and friends. Take your daughter or son for a photo session and have them photographed in a Christmas outfit and/or in a Christmas setting or with Xmas props. If there are siblings, take them all for the photo session. Buy a nice wooden or metallic frame and you've got the perfect keepsake gift for the entire family! 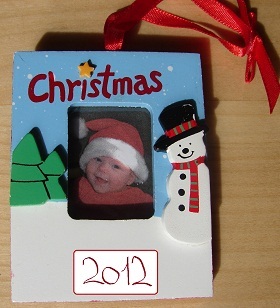 Additionally you can have all your Christmas cards printed with a 'Christmassy' baby photo. This makes your Holiday greetings rather special. This also is a quite easy homemade Xmas present from babies and toddlers. Just get a canvas panel and use a non-toxic, infant safe ink print kit to print your kid's hand and / or footprints on. You can also use several colors and make lots of colorful handprints and footprints. If you experiment a bit around you can also do a pattern or make a heart with the hand- and footprints. Google for 'colorful handprints' at Google Images and you'll get lots of creative ideas. Of course you can also make 'Christmassy' artworks with your hand-/finger- and footprints such as a reindeer, a Christmas tree, Santa, etc. To view examples go to Google Images and search for 'Christmas handprint crafts' and you'll get tons of really cute ideas! Another really sweet option is to put a paper heart or sticker in the center of your kid's palm or foot AFTER you painted their hand or foot. Then press to paper and you'll have a heart in the middle! For Xmas you can also use a tree sticker, a star sticker, etc. It's very cute to include the 'originator's' name, the date and some little text with your prints. 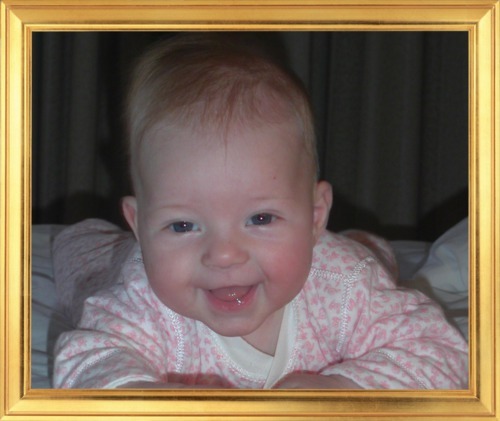 ME, when I was small! how small I was in 2018, in the month of December! Browse more presents to give from baby, especially for mommy, daddy and grandparents. Return to Christmas gifts for baby.